More than 200 elite PR professionals packed a ballroom on Wednesday at the venerable National Press Club in Washington, D.C., for the annual PR News PR People Awards luncheon, which also featured the induction of six PR Hall of Famers, the Top Places to Work in PR and the 15-to-Watch honorees—an already accomplished group of PR up-and-comers. 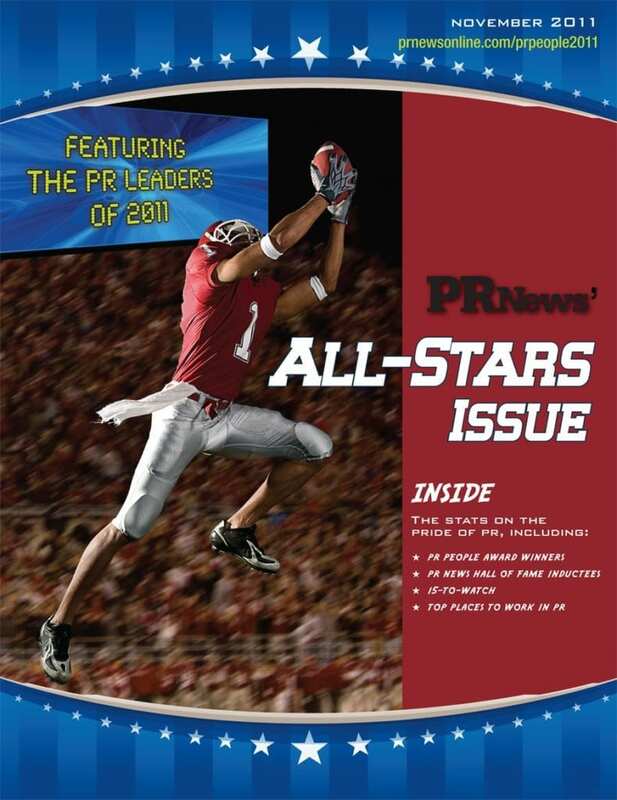 PR News&apos; All-Stars issue to learn more about all the honorees. Kicking off the day were the PR People Award announcements, with Julie Harkavy Fisher, executive VP at Weber Shandwick, taking home the award for Account Director/Supervisor of the Year, notably for her work with client Electrolux. Dallas Lawrence, chief global strategist at Burson-Marsteller, and Cindy Sanders, regional director of public relations at Wellpoint, were co-winners in the Crisis Manager of the Year category—Lawrence for his work with the Nuclear Energy Institute after the earthquake/tsunami in Japan, Sanders for her keen strategy following a security breach at Wellpoint. Following Ettus&apos; keynote presentation, six distinguished, influential PR leaders were inducted into the PR Hall of Fame: John Deveney, president of Deveney Communication; Richard Edelman, president and CEO of Edelman; Roger Frizzell, chief communications officer at PG&E; Mary Henige, director of social media and digital communications at General Motors; Dave Senay, president and CEO at Fleishman-Hillard; and Melissa Waggener Zorkin, CEO and president of Waggener Edstrom Worldwide. Asked to offer the best advice they’ve received in their careers, John Edelman, who accepted the award for his brother Richard, said, "Get to know the media, and know what the stories are." Deveney said the thinking about the question brought him to this conclusion: "I’ve accomplished absolutely nothing on my own. I’ve been incredibly fortunate, working with amazing people, and I’m blessed." For such a celebratory day, that might have been the best piece of advice of all. John Deveney likes to lead people into PR battle. Whether establishing on-site communications operation and media centers during hurricanes Katrina and Rita, or creating and leading the Louisiana Office of Tourism’s response to the BP oil spill, he gets great satisfaction from leading teams of others—and making them better communicators. Enthusiasm has fueled Deveney’s communications success, as he moved through government, hospitality, education and healthcare sectors before opening his own agency in 1996. For 60 years Edelman has remained an independent, family-owned agency. For Richard Edelman, that’s a source of deep pride. “Our independence has allowed us to consistently put the interests of our clients and employees first, and to invest in our company and its future,” he says. The agency’s president and CEO since 1996, Edelman has extensive experience in marketing and reputation management, and has counseled several countries on economic development programs, including Egypt, Israel and Mexico. After eight years as VP of corporate communications at American Airlines, in October 2011 Roger Frizzell moved on to California-based energy company PG&E, becoming its chief communications officer. And just like he did at American, Frizzell will concentrate on improving customer service while cementing PG&E’s reputation—both externally and internally. To say that Mary Henige has seen it all at General Motors would not be an overstatement. It’s been 25 years since Henige began her career as an exhibit representative at GM’s former World of Motion pavilion at Epcot Center, Walt Disney World, in Orlando, Fla. Since that time, she has held a variety of communications positions with the iconic American car manufacturer. Dave Senay has worked across multiple communications practices throughout several regions of the world—including Europe, the Middle East and Africa—leading account teams in industries ranging from telecommunications and information technology to healthcare, food and automotive. Senay was named president and CEO of Fleishman-Hillard in July 2006, and made a full-fledged commitment to “switch on” the agency, integrating digital into every aspect of the business. In 1983, Waggener Zorkin formed an agency with business partner Pam Edstrom. Today, Waggener Edstrom has grown to more than 800 employees, a fact that Waggener Zorkin takes great pride in. “Without a doubt my proudest accomplishment has been our ability to build a large, independent agency that continually gets and keeps great people,” she says. Emilie Valle - Cone Inc. 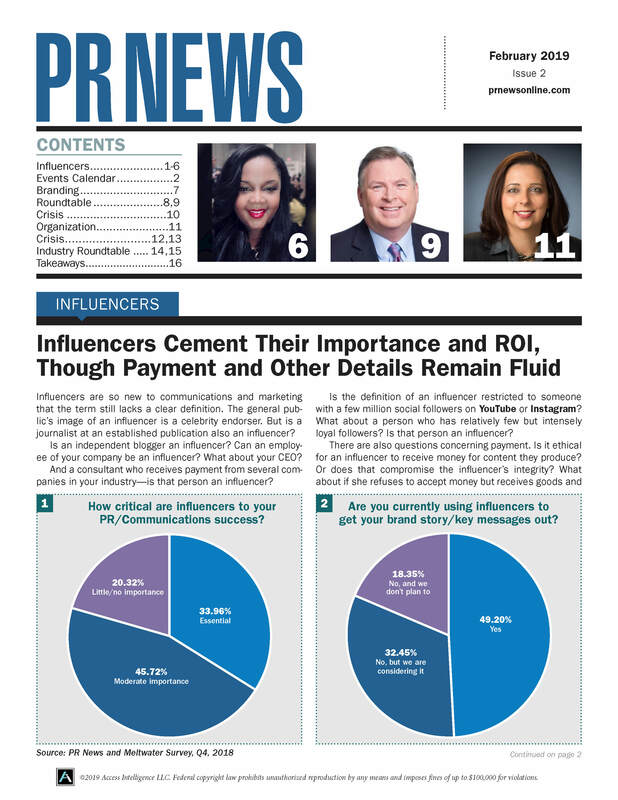 Winner: Kim Zimmer - Goodwill Industries International Inc.
Jill Allread, APR - Public Communications Inc.